The anterior part of your eye consists of the transparent cornea, which serves as the eye’s “windshield”, allowing us to view the world, and at the same time, protecting the eye from external impacts. Located behind the cornea is the pupil, the part of the eye through which light can enter the interior of the eye. Depending on the intensity of the light, the eye widens or narrows the pupil in order to control the amount of light passing through (bright light = small pupil, dark light = large pupil). This process is also referred to as adaptation. The iris is the visible, pigmented part of the eye, usually providing the “eye colour”. 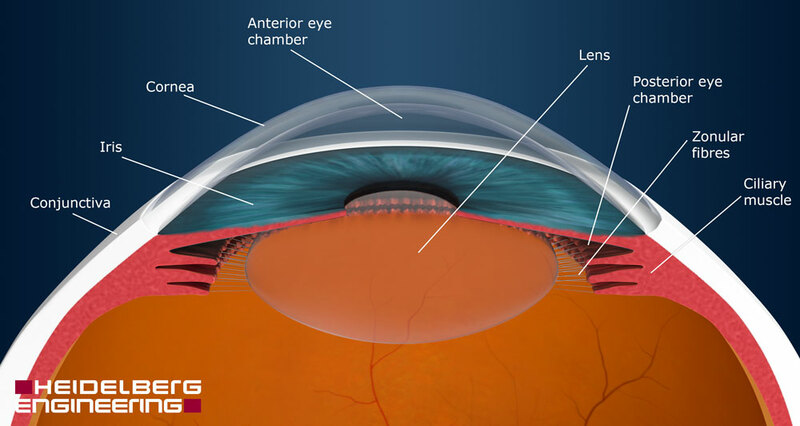 Directly behind the iris is the lens, which is surrounded by a fine membrane and on the right and the left is directly connected with the ciliary muscle by the zonular fibres. The ciliary muscle is controlled by the brain, allowing it to modify the form of the lens, which in turn permits us to clearly see both objects in the distance as well as the words of a book close up. This ability of the lens is also referred to as accommodation. After the age of 40, this ability constantly declines, which is why most older people need to use reading glasses.